Belgian white chocolate cheesecake on a biscuit base topped with blackcurrants, redcurrants and raspberries. Our cheesecakes are hand finished by our experts in the West Country. 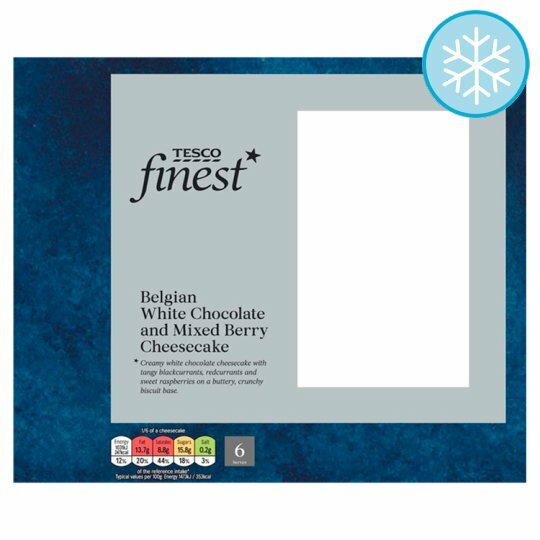 They use smooth, creamy Belgian white chocolate and tangy fruit for the perfect combination of a sweet and refreshing flavour experience. The biscuit crumb base is rich and buttery for a smooth finish with every bite. Full Fat Soft Cheese (Milk), Wheat Flour (Wheat Flour, Calcium Carbonate, Iron, Niacin, Thiamin), Sugar, Whipping Cream (Milk), Butter (Milk), Blackcurrant (4%), Redcurrant (4%), Water, Raspberry (3%), White Chocolate (2.5%), Palm Oil, Milk, Egg Yolk, Demerara Sugar, Invert Sugar Syrup, Rapeseed Oil, Maize Flour, Cornflour, Egg White, Tapioca Starch, Glucose, Raising Agents (Sodium Bicarbonate, Ammonium Bicarbonate), Natural Vanilla Flavouring. Defrost thoroughly for a minimum of 3 hours in a refrigerator.